CAMRA offers to pull ‘sexist and insulting’ recruitment leaflets, but young drinkers demand public apology | It Comes In Pints? 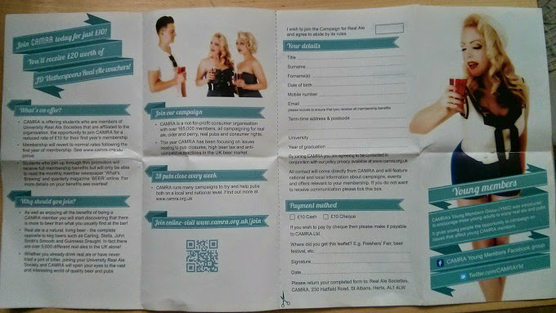 Young beer drinkers have expressed outrage at a “sexist and insulting” series of recruitment flyers CAMRA has distributed to universities across the country. The flyers, which aim to recruit new members to the real ale society, feature pictures of women in low-cut tops and dressed as pin-up models. They were sent to university real ale societies to be distributed at Freshers’ Fairs. The CAMRA Young Members board expressed their disapproval when they were consulted before print, but said they had been ignored. Rowan Molyneux, a young beer blogger, said that she originally thought the leaflets were a hoax. Members who contacted CAMRA to complain were “brushed off”, she added, and the organisation rejected claims that it was being sexist because it had women in its board. CAMRA has offered to withdraw the leaflets, but young members have called for a full public apology to the university societies that acknowledges “the sexist nature of the flyers”, an apology to the Young Members Board and the creation of a transparent complaints process. A petition calling for action from CAMRA currently has 77 signatories. ICIP has approached CAMRA for comment. This entry was posted in Beer and culture, Women and beer and tagged Beer, camra, feminism, real ale, sexism on 13/10/2014 by icipints. Pingback: How should CAMRA campaign? Group responds in ‘sexist leaflet’ row | It Comes In Pints?